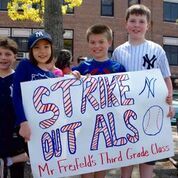 From left, Marion Street third-graders Anthony Fasano, Maya Davies, Nicky Vito and Peter Rahaniotis during the ALS Ride for Life visit. 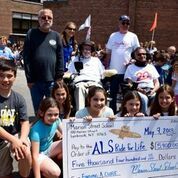 Marion Street students presented a $5,400 check to the ALS Ride for Life organization. 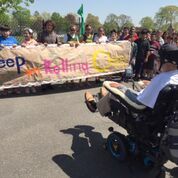 South Middle School showed their support in the fight against ALS. 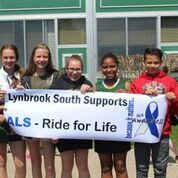 South Middle School seventh-grader Sophia Yaker (right) raised approximately $200 for the Ride for Life foundation. 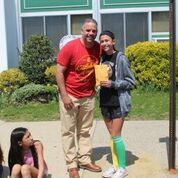 She is pictured with her father, board trustee David Yaker (left).